St Thomas' Church on Southgate Street was originally built in 1845 and had latterly been used as the council's Records Office after ceasing its religious use in 1969. You now have the opportunity to stay in this magnificent conversion that comprises 9 individually designed modern apartments. The Loft is on the second floor and taking the stairs means that you can view from the landings the grandeur of the architecture, which the developers have successfully retained. Access via the private lift leads directly into the apartment. 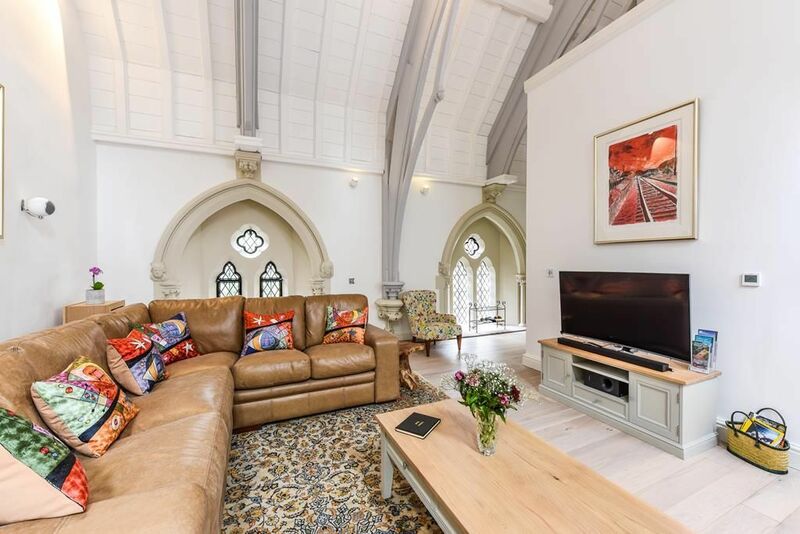 The loft style apartment has soaring ceiling space and arched original church windows complemented by the clean, white, minimalist lines of the ultra modern kitchen; that includes an induction hob and boiling hot water tap. A built in sound system and designer lighting shows off the splendour of the comfortable living space. This quirky accommodation has two en suite bedrooms, one of which is accessed via a further staircase to an upper floor. Both bathrooms are super luxurious rooms you'll want to spend time in! Upstairs has a stunning freestanding bath, whilst downstairs has a sumptuous walk-in shower. Living here is like living at a 5* hotel. The owners of the Loft at St Thomas' have cleverly dressed and furnished the space including local Winchester touches to the decor that fits effortlessly within the historic feel of the building. The Loft at St Thomas' holiday rental in Winchester is just the ticket for couples or a family wanting a luxury holiday rental in Winchester. Short lets are also possible for those needing to be in the Winchester for longer stays - just call us to enquire. Huge wow factor, everything you need. I can’t think how it could be improved. Thank you very much for your fabulous review of The Loft at St Thomas' we are delighted to hear that you had an enjoyable stay and hope to welcome you back again in the future! We loved it more than we hoped we would. Absolutely stellar. The photos don’t do it justice. Amenities new, clean and comfortable. If we have the chance to return to Winchester, we’ll try to stay here again. Thank you for your great review of The Loft at St Thomas, we are really pleased that you enjoyed your time here. We stayed in Winchester for three day - celebrating graduation of our daughter. In Loft, we had great time all family together. The Loft is amazing place - few steps to centre of Winchester, Cathedral… Is modern and well equipped but still you feel warm, like at home. Thank you for great time!! Thank you ever so much for your lovely and informative feedback, we are delighted that you enjoyed your stay at The Loft at St Thomas', and got the chance to explore the lovely city of Winchester! The apartment is stunning and very conveniently positioned for access to the shops, restaurants and tourist sites. The attention to detail inside the apartment made our experience all the better. However, neither guest slept very well, we felt the noise of passers by/traffic during the night/early hours disturbed us both. We also both thought we heard someone access the main building during the night and we heard loud voices which was disconcerting. The entrance security is good but we still felt a little nervous unfortunately. The booking process was simple and efficient and we needed to make contact with Paula during our stay and she was very helpful, thank you Paula. Fantastic lighting system and sound system, decor, furnishings etc, couldn't fault anythig like that. The TV was frustrating but we got there in the end. A beautiful property where they have made the best use of all the original features. Being in the "Loft" means you have the upper parts of the windows, the carved stone figures and the vaulted ceilings. Comfortable and spotlessly clean. A few high tech features which passed this old fogey by but the instant boiling water tap scored a hit with my wife. If we are in that neck of the woods we would not hesitate to book again. Many Thanks for the lovely review. We are delighted that you had such a wonderful stay and that you would return in the future. The property is outstandingly beautiful, finished to the highest of standards. All modern amenities. The party I took where gobsmacked at the property as a whole. We stayed for a friend's wedding in the area but this would be perfect for a couple or a family. I cannot begin to express my thanks to the owners for the quality of the place, the price and the warm welcome of drinks and nibbles. Winchester in on your doorstep with just a 3 minute walk from the high street and cathedral. If you can tear yourself away from the apartment, why not treat yourself to lunch at Rick Steins fish restaurant. Look out for the Peregrine Falcons nesting in the tower.